A few days ago, I was one of many critics who panned the film "Sucker Punch." Though I hadn't written my own, I advocated several reviews that I felt reflected my sentiments. The very first video games were the result of experiments and hobbies in the 50s and 60s, created within university confines. They were mostly created out of boredom and were no more sophisticated than monotone blocks or blips on Cathode Ray Tubes. Their function was simple: to facilitate competition between others or with oneself. Soon the concept became commercial, and as time went by, competition, consumer demand and technological advances fueled the evolution of video games. Increases in storage permitted more content. 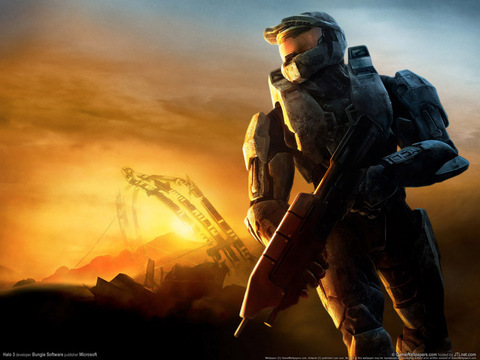 Greater memory and processing speeds allowed complex movement and visual effects to improve. Simple moveable objects gave way to vaguely recognizable characters. A single screen of activity grew into "side-scrolling," and eventually movement through simulated three-dimensional space. Inevitably, all these developments became the source for the growth of narrative in video games. Narrative had been associated with the medium for quite some time, but initially as a marketing tool. Read the box covers for Atari's "Berzerk," "Defender," or "Missle Command" and you'll be told what your character, your tasks, and your overall mission will be. 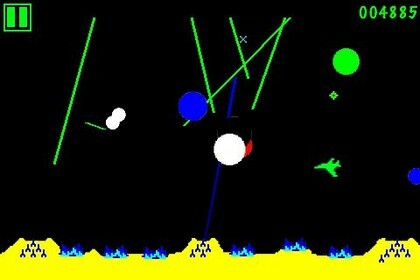 But in reality you'll be shooting colorful lines fired from one pixilated blob to a whole host of others. It never seemed that silly to us gamers when we first played these games. We never viewed these screen blips as realistic beings or objects. We were playing pretend, investing our emotions and imaginations in our video avatars, however primitive they seemed in appearance or capability. Newer generations of consoles and computers allowed more text and increased picture quality. Blockish objects started morphing into detailed images and figures. "Super Mario" would be saving the princess, Ryu Hayabusa of "Ninja Gaiden" would go on epic quests, the House of Atreides would come to rule in "Dune II," music would be composed to set mood, and many other stories of fun and adventure would soon come to be realized. With each improvement in the appearance and gesticulation of our avatars, we would invest more and more of ourselves in them. Mario's poses would become as distinct as Chaplin's. We'd imagine Michael Jordan really playing for the Chicago Ox in "Double Dribble." 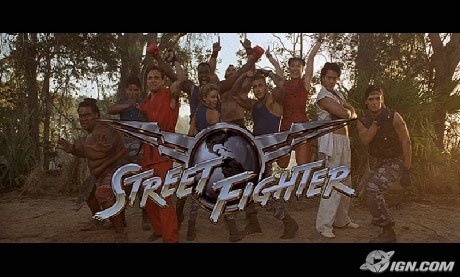 We'd remember the signature finishing moves of "Street Fighter" and "Mortal Kombat," hum the tunes to "Legend of Zelda," and fly space fighters in "Wing Commander" that would rival those in "Star Wars." These progressions in narrative, setting, and characterization were overwhelmingly at the service of competition. You had a score to top or an enemy to defeat. The specific skill you wanted to improve or enjoy was more important than the plot that it hung onto if any. This was the very idea of video games from their inception. But at this point the medium had become about much more than just fun. It became a receptacle of emotional investment, a new storytelling frontier, and surprisingly, a form of artistic expression. 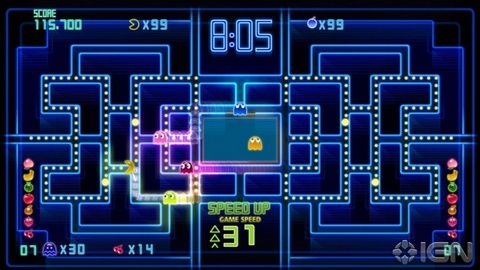 Evading pawns on a chessboard could not evoke a response as emotional as getting Pac-Man to evade ghosts, or Luigi to avoid koopas. Any board game, no matter how well crafted, could never approach the visual splendor of "Final Fantasy 7." Tag, hopscotch, or cops and robbers never tell stories, while games like "Fallout" offer various endings. Perhaps the very description is the problem, as "games" deal mainly with strategy and competition. But a video game is a different beast, one that has evolved significantly past its forbearers. It isn't merely a game, but a medium, conveying information and artistry that has yet to hit its stride. Its capability for human expression is not a replacement for its original purpose, but a complement. 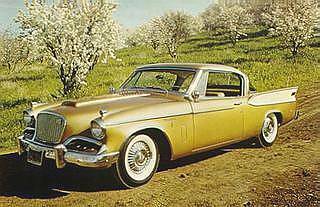 Similarly, a Studebaker may be all the more prized for the beauty and character its design when viewed in the context of what it was made for: transportation. One example that fits this description is "Grand Theft Auto 4," the latest in a series usually chided by the mainstream media as extremely violent. 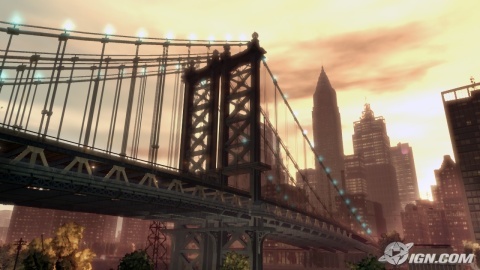 Though it is that, its latest iteration has one of the greatest characters ever created in the history of the gaming: a fully realized New York City. GTA4 is not aesthetically valuable not just because of the carnage one can create in its workings, nor of its countless unique characters, which are all terrifically voiced. But because of the "Big Apple's" staggering detail, marvelously accuracy, and remarkable fit for its "Scarface"-like storyline. Moving through its streets, its buildings, its parks, with sections made to fit within the GTA sensibilities, and listening to impeccably chosen songs across the decades to set appropriate moods in specific moments and locales; this virtual city is a feat that has never been done before. Another video game where spatial movement can be observed aesthetically is "Prince of Persia," where an avatar must navigate physical obstacles to get from point A to B. Rarely has what is essentially a puzzle game looked so picturesque, with its hero's physical movements so graceful and athletic, along with animation techniques that further enhance its appearance. From a purely visual standpoint, this game is a vivid dream. Though many gaming experts feel that gameplay should be the focus in the artistic development of video games, there are other aspects that can be manipulated without taking away from its core. 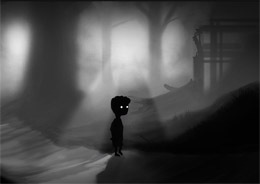 Take for example "Limbo," probably the most atmospheric video game ever made that facilitates the feeling of quiet dread. No music is used; no color appears. Its palette is purely black and white. Its protagonist is a child forced to tread through the unknown. His movements are minute, leaving only the sound of footsteps. And the clues to his humanity are his small white eyes. The dangers he encounters are never telegraphed easily. Each anticipated encounter is terrifying. His adversaries include sharp objects, shadowy monsters, and even other children. A special video game separated from the rest by its signature look and style and its mastery of mood (never play this game in the dark). Or take "Shadow of the Colossus" a fantasy game that forgoes a lot of traditional video game elements and somehow evokes true wonder, regret, loss, and surprising poignancy. It has a young hero who looks far from heroic, running clumsily, looking to resurrect his fallen love. He hears an alien voice telling him to slay 16 colossi, each of which is so wondrous a creation that Miyazaki would be proud. There are no foes on the way to your adversaries, just a dreamlike landscape that reminds me of the Valley of the Wind. You don't have a score to keep, no levels to climb, no abilities to gain, no extra lives to add. Find a colossus and kill it. And once you do, it doesn't feel like a victory, but like an injury to the Earth, making you think what a waste man is. Even the ending to the game is completely unexpected, wonderful, and poignantly connected to its predecessor. One game that completely changed how I think about gameplay, and that was "Braid," a game unlike any other before or since. 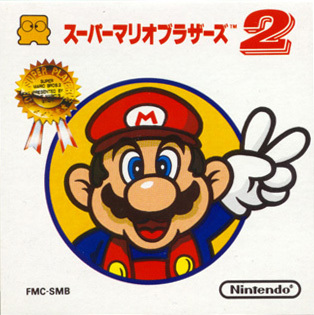 It took the side-scrolling platform genre (think Super Mario) but used time and direction (as perceived within the game) as obstacles. Imagine climbing a platform with moving objects, but when your character moves from left-to-right, everything else moves forward in time; when your character moves from right-to-left, everything moves backward in time. Describing it as such doesn't seem like much until you experience the game's absolutely ethereal feel, which can range from whimsical to melancholy, depending on how you interpret its journey and story. Its backgrounds are like organic Van Gogh paintings. Its jigsaw puzzles reveal the downward spiral of a loving relationship. And its finale, a kind of gaming masterpiece, uses the flow of time to show how the hero really is the villain. One cannot make a judgment about these games or others like them simply by watching recorded gameplay, any more than you could judge a book by its cover, or a movie by its trailer. What ultimately defines a video game is its interactivity: the ability for its audience to participate in and shape its experience. Video games are an elastic medium, capable of malleable environments and fragmented storylines (or the illusion of such). With narrative art forms, there is no direct participation other than to receive, and hence no competition compelling one to finish. "The game designer's craft makes it possible for the player to feel as if they are in control of the situation at all times, even though their game play and emotional experience is significantly sculpted by the designer. It is a tricky balancing act, making the player aware of the challenges they confront, and at the same time, insuring they have the resources necessary to overcome those challenges." This statement clarifies why many video game adaptations from film and film adaptations from video games ultimately fail. Each art form's success or appeal depends on how each operates intrinsically. Crossing aesthetics is like driving a left-hand drive car on the left side of the road. This also serves to show why we shouldn't compare films with video games, any more than we should compare apples and steak. 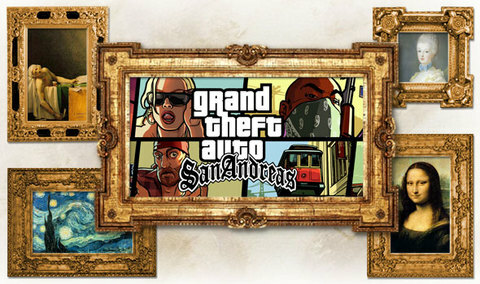 If video games have artistic merits, why aren't they considered seriously? One basic reason is barrier to entry. Unlike movies, which in essence any person can view, many video games require skill to be experienced (one of the medium's unique traits). One tends to get wiser at movies with age. But if you asked John Madden to play the latest version of his franchise video game, he'd be sacked. It's the main reason why the mainstream hasn't accepted it fully. If you thought films have been hopelessly commercialized and pigeonholed, it's even worse for the gaming industry. Sequel-itis is more rampant (there are more Madden video games than Bond films). Creativity is much harder to come by. Corporations are more capable of making big-budget games, which cost as much if not more than big-budget movies. And artistry in games is the last priority. Games don't connote artistry, but fun. Video game criticism also plays a huge part in the lack of the medium's general acceptance. They judge by very different criteria due the nature of the subject. Games are almost universally dissected and evaluated according to their components (story, graphics, gameplay, etc) rather than as an overall experience. But if they do look at the overall picture, video game criticism lacks the same kind of passion, prose, and knowledge that exists in their counterparts (one exception is Seth Schiesel of the New York Times). This can't be blamed on video game critics, as the medium is quite young. Film criticism has had a century to have its ideas and theories refined, while video games have just recently entered into an arena worthy of discussion. Unless its critics start becoming more familiar with the study of its scholars, it will be a while before video game criticism gets a footing in punditry. Roger Ebert once said that he believes that video games can never be art. I won't lie; those words stung me. From the day I started reading him, he has always been affirming films and artists with thoughtfulness and respect that the establishment didn't seem to recognize. He gave weight to genres like anime long, martial arts, fantasy, action spectacles and silly comedies by treating them as seriously any other film. He once compared Jackie Chan to Charlie Chaplin and Jim Carrey to Jerry Lewis. He cited the skill and gravitas Arnold Schwarzenegger and Bruce Willis add to their roles. He gave credit to where credit is due. This is my "Forty Guns" effort. Martin Scorsese once tried to convince Michael Powell how great Samuel Fuller was. I'm no Scorsese of course. But how he felt at that time is how I feel now. Video games are art, just not in the way we would traditionally think of or perceive. Perhaps not a high art, but art nonetheless. It is true that no video game has ever been considered to be on par with any great work of art, and I believe none can be deemed as such, for now. It's a young art form. And I'm sure that if Roger were asked that same question with regards to film, when movies where merely nickelodeon pieces, he'd say the same thing. Not all arts reach everyone. There are some that I myself will never consider as such. But I do my best to give each the benefit of the doubt by experiencing it on its terms. Rog, I do hope that one day, you can. Note: My deep thanks go out to @carolynmichelle @natashabadhwar @msmanet @aliaena and to all those who gave their input. A very special thanks goes out to Professor @HenryJenkins whose studies on video games and media as a whole provided the backbone of this piece. Whether you find video games meaningful or are skeptical of their value, please read his scholarly piece "Games: The New Lively Arts" and the illuminating "Reality Bytes: Eight Myths About Video Games Debunked."